2 posts were stuck, so anyone posting, D2Cat and 85Hokie go back and reread. That's interesting. 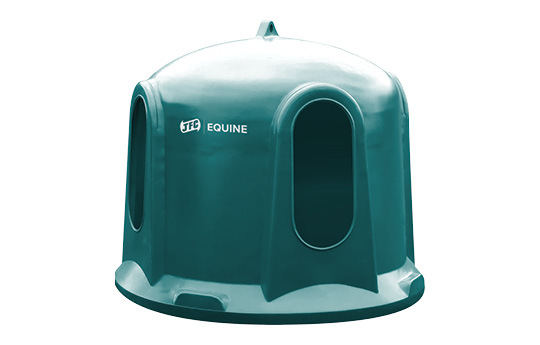 I've never seen a hay dome like that, but makes good sense. I even looked online and didn't see them. Somebody down the road from me has put out something similar for two horses. Seems to have openings for heads and necks, and then a panel with clear plastic for light. I wondered if it wouldn't promote heaves since the hay dust is confined to the bell too. I guess there was a delay due to distance? Or perhaps only haybell ? Most uses here are the pre-dry hay. Large bale rounds wrapped in (green) plastic. Thats hay that was just not dry enough. Plus side is that those bale doesn't have the ammount of dust that really dry hay has. Downside is when unwrapped the bale starts to heat up after 2 weeks (soonen in the summer) so for 1 horse you have more wastehay. To answer your question better than I did before - as for weights on the front end, I would imagine that you could place anything from 100 kilos to 250 kilos if you have weight to place. your machine weighs in at about 2000 lbs without any attachments. SO picking up a 1000 pounds on the rear - you would want weight on the front too. Typically a tractor has as a loader up front and weight is added at the rear so the tractor has traction at the rear and so that the rear does not come up when the load up front is too heavy. In you case, you are doing just the opposite. 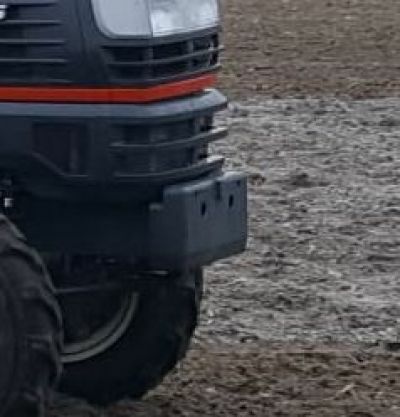 Here is what I would recommend - find the amount to place on the front that is not too heavy, something you can leave there and be able to use the tractor with the bales on the rear - yet once the bales are loaded on the rear, it will be enough weight to offset the bale itself. Spears are not very common, some use them with dry small bales an pick up multipe with a small tractor. The farmers who produce the bales use mostly a frontloader with hydraulic clamp to prevent damage when harvesting wrapped bales. The standard iron cast block weighs about 60lbs mounted with 2x M10 fine. I've bought five (caterpillar) plates 50kg ( 110lbs) each. 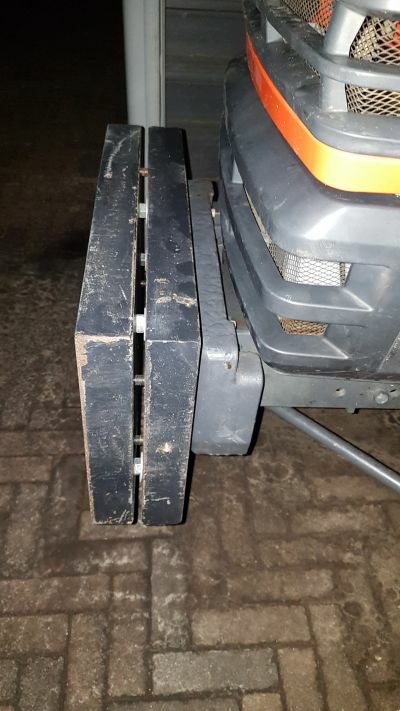 The standard block with two plates mounted worked fine on pavement, when driving on sand the frontwheels are barely touching the ground. I think the best thing is to remove the standard block and only mount the "catterpillar" plates. Reason for that is the the standard blok is mounted with two m10 bolts only and i have now mounted the first caterpillar plate on the block with 2xM12 (two pre drilled holes in the block). If i mount a plate first i can use multiple bolts. 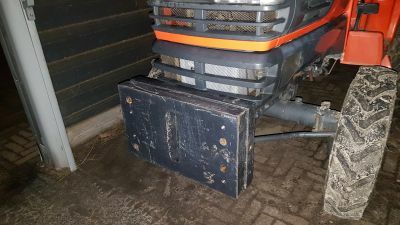 It's a good idea to choose the ammount of weights so it can stay on the tractor with or without bale. Is it no problem to leave 150kg (330lbs) or 200kg (440lbs) on front? Risk of front axle wear etc? I'm curious about your feeding process. The feeder net, do you have one big enough to around the entire big bale? Then have a cover you install over the entire bale (to keep the hay dry)? I feed two horses (portable yard ornaments) using 1200# bales. I put them under a lean-to (on the side of the barn) back in a corner and have a couple of panels around the hay to keep the horses out. My cover is the top of the shed, and I have no net. I would imagine the net saves a lot of wasted hay. With your forks on the back and hay on a pallet you have a good way to use your tractor with out needing a front loader. I would just keep loading weight on the front bracket and experiment with how it handles. This feeding proces is also new to me and a attempt to make my life easier. Now "they" are working on their second bale. The general idea of the net is its works like a slow-feeder. 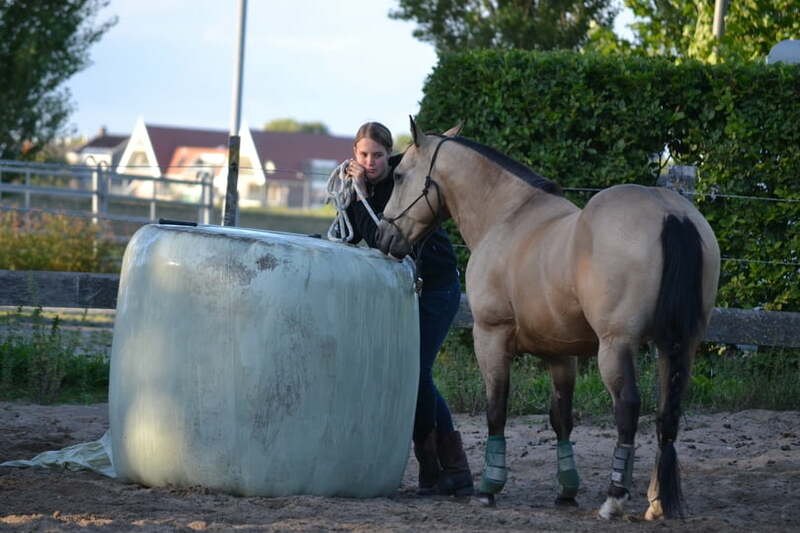 The horse(s) eat slower (smaller ammount per bite) and needs to work harder (pulling out of the net) to get his food. I still see some hay waste outside the dome. This is a example of a net. I have the net (bottom picture) to use with a dome. The first picture looks something for your location?